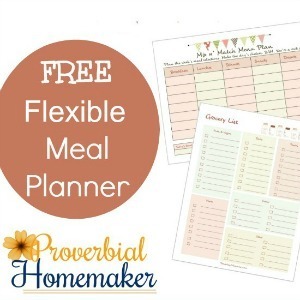 Finally Rock Meal Planning with this FREE Flexible Menu Planner! I don’t think I’ve ever been able to follow a rigid menu plan. I am far too likely to change my mind or forget to buy or thaw some ingredient, and so those types of plans never really work for me. 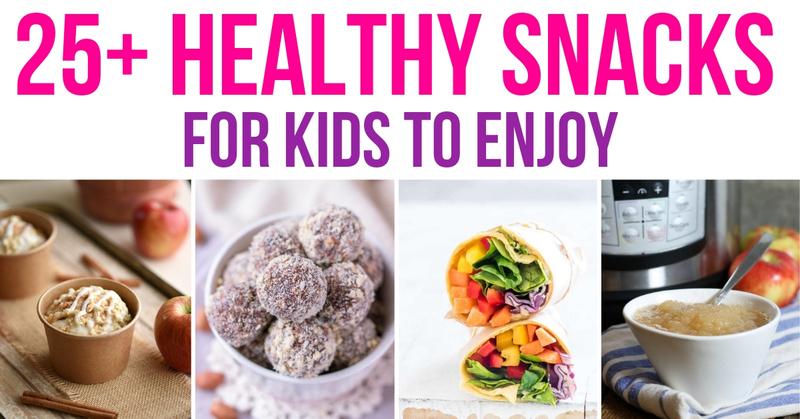 However, I still want to take advantage of the benefits of meal planning, such as saving money and avoiding the dinner-time panic. That’s why I LOVE my Mix & Match Flexible Menu Planner and today I am sharing it with YOU! Each day, choose one of the breakfasts, lunches, and meals from the lists on the planner. Cross out what you’ve already used and keep in mind leftovers (such as having fried rice for lunch when yesterday’s meal included rice). That’s it! It’s simple, flexible, and gets the job done. With this planner, you can move things around without feeling guilty, because you actually DID stay on the plan! 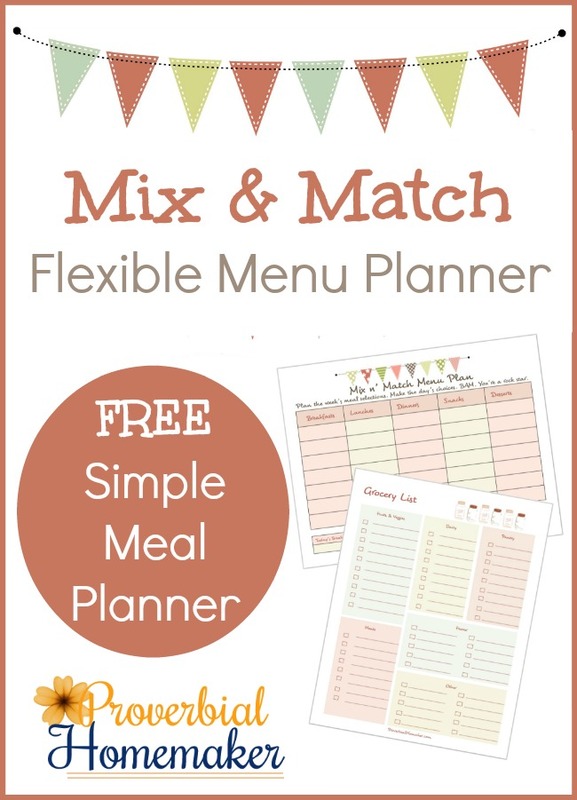 The Mix n’ Match Flexible Meal Planner AND the grocery list shown are available FREE! You can also use it as a part of the Proverbial Homemaker planner. Either way, you I hope you are blessed by it! If you have any issues receiving the file, check out this troubleshooting guide or feel free to email me! An Extra Tip – The Backup Plan! One other thing I do as a part of my meal planning that helps a TON is set up a backup plan. 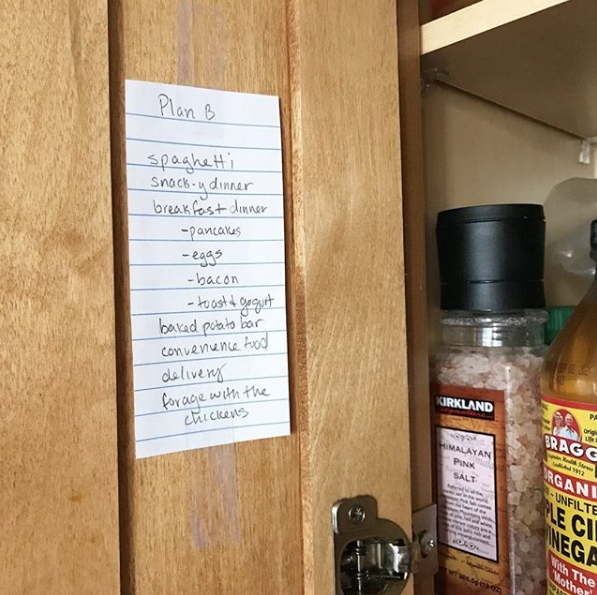 I literally write down all the fast-fix meals I can think of that I usually always have on hand and tape it to the inside of my cupboard. It may seem simplistic, but at the end of a long day of parenting and homeschooling, my brain is fried. This list has saved me the cost of pizza delivery more than once! So, your backup plan is ready and waiting for those moments when you drop an entire pot of potato soup, catch the crock pot on fire, shatter the casserole dish, use salt instead of sugar in the French toast, or over cook the chicken so much its rendered inedible. (all. true. stories.). Hi Christina! You just click the big blue Download button and enter your email and the link will be sent directly to you. 🙂 Let me know if you have any trouble! Can you tell me what browser you’re using and if you have popups blocked? Seems to be working fine when I test it so any info that helps me figure out how to fix it for you guys (and others who haven’t said anything) would help! Wow I think this one is a keeper, simple enough to use and adapt to us. Thank you.